Our large luxurious group villa can sleep up to 20 people all year round and it is so perfect for large groups of families and friends. Our villa is so amazing for large groups and we are completely child friendly and also fully accessible for a wheelchair user. On the ground floor we have wheelchair access from the driveway all round the whole of the grounds and a beautiful ground floor bedroom with a large wetroom ensuite. We Provide a shower chair for the open shower and all grab rails are in place. If you require special equipment there are two companies on the coast that you can hire from who do deliver to our villa. For the kids we are so child friendly you will be extremely happy. What we find is if the kids are happy so are the parents. We have a temporary pool fence we can put in place for your holiday if you have children so you can really relax as a parent. Also all the patios and terraces are gated and we hold cots and high chairs on site. The beauty of our villa is when its time for the kids to go to bed they can go to sleep and then its adult time(if your in a hotel you have to go to the balcony but hiring our villa gives you full adult time later in the evening). The layout of the villa is very special giving you privacy at bed time. We have heating in the villa and air con so no matter what time of year you join us you will have all your needs met. The bedrooms have air con for the hot summer months and the heating is there for you in cooler months when its hot in the day but the evening temperatures drop. In the months of April and May and September and October the pool is heated for you to 27 degrees. You also have the most beautiful hot tub set at 39 degrees to just relax and watch the sunsets with a nice glass of wine and this is up and running all year round for you. You can use the pool anytime of year but in the months of November to March is it not heated but your welcome to swim if you want to. We have a cover on the pool that is easily removed by a roller out of the summer season. The villa is set in an amazing location with fantastic views,close to all amenities with even a few tapas bars in walking distance and a small shop.Being only 10 minutes from the main motorway it is perfect for touring Malaga,Cordoba,Granada Seville.Every detail in this villa has been carefully thought about giving you that ultimate holiday of a lifetime and disabled access on the whole ground floor. For the groups of up to 20 There are 7 bedrooms,6 bathrooms,4 lounges and 5 kitchens giving you the space that you require. The villa is perfect for children as we really care and have ensured safety is priority here.We have a security fence for the swimming pool that we can pop in place for your group if you have small children so they can not enter the water without an adult. All the terraces and patios are gated so adults can relax and have peace of mind. We also have 3 double sofa beds to sleep a further 6 that are top quality. 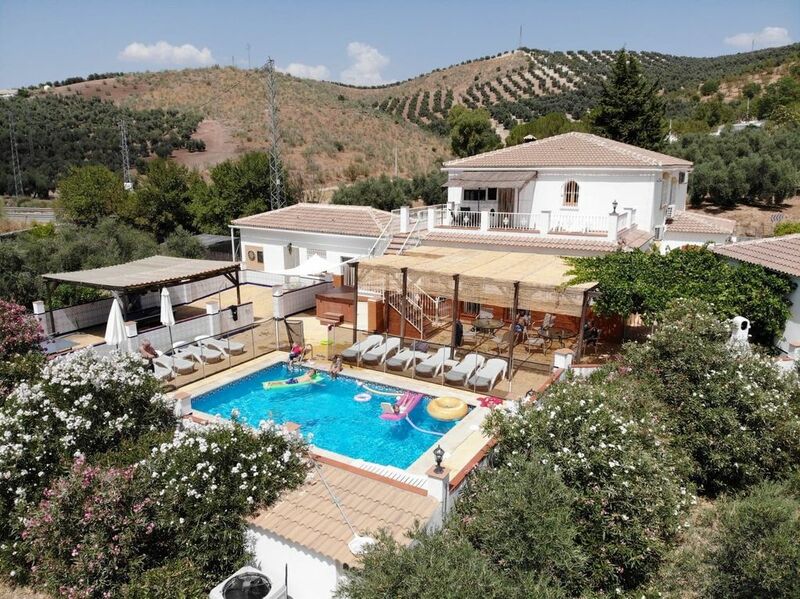 Set in two and a half acres there is an abundance of terraces,patio areas and pergolas to enjoy the perfect al fresco dining experience after a day of touring Andalucia or just relaxing in the sunshine. We have our cinema room with a 60 inch tv with a sound bar and subwoofer with a hard drive packed with all the latest movies.Just shut the shutters put your feet up and get the popcorn out and you are in a cinema. The most exciting news is that we have a Chlorine free magna pool system installed!! !This is amazing-we are one of the first ever pools in Spain to have this system as it is brand new to this Country arriving over from Australia.The pool will run with crystals instead of Chlorine. NO MORE CHLORINE - JUST PURE MINERALS!!!!! The Magnesium Chloride that is found in the Magna Pool minerals come from the ocean.This form of magnesium has been found to assist your internal health, as well as helping to relax your mind and body. It can help in detoxifying the body, reducing aches and pains, relieving stress and anxiety and providing the muscles with energy. For all our guests at Casa Pino Solo....you will no longer have chlorine in the swimming pool but instead these amazing minerals.....you will swim in our pool on your holiday and feel rejuvenated. This will be pure luxury for you like visiting the spa for the day but its your pool for the whole duration of your holiday!!! There are Many food options available to have delivered in to the villa for your convenience. We are set in a fantastic location giving you the freedom to enjoy using our unique facilities day and night and also having all the amenities close at hand within a 10 minutes radius plus a couple of tapas bars in walking distance.You can really enjoy many of the restaurants locally and there is such a wide range to choose from including gorgeous Spanish restaurants,Italians,English,Chinese plus much more. The whole villa is fully equipt with absolutely everything you will need like home from home and we also offer you the flexibility of ordering delivered foods in to the villa so if you don't want to cook then you can just place your orders with me and i will organise everything for you. Within a short drive you have many villages like Fuente Del Conde,Villanueva De Tapia,Iznajar,Salinas,Cruz De Algaidas,Loja,Algaidas and many more. The surroundings villages offer fantastic restaurants,bars,tapas,markets and are all steeped with history and for people who are looking for lively times this can be had right here too. It is a real treat to be inland only an hour from the coast but you also have the luxury of our 18 mile long lake with its own beach so you do really get the best of both worlds and also to have bars in walking distance is perfect.The lake is gorgeous and you can go to sunbathe there for the day or for the more energetic you can use the local adventure sports company to do different options of sports activities that you may fancy. We do specialise in organising party holidays for anyone out there looking to celebrate that special birthday or anniversary in fact anything you want at all.If you have a special occasion coming up then look no further and i am here to help you every step of the way to ensure your holiday and event is organised for you. Our villa is a luxurious place to come and enjoy with your group. We are here to help you organise your holiday from start to finish anything you want to give you the best experience ever. If you have any special requests do not hesitate to ask and we will do our upmost to help. We supply Hair dryers in every bedroom, Bathroom towels and pool towels and even bathroom scales to weigh your cases. Myself Lisa and Nigel have been running Casa Pino Solo now for 13 years after making the move to Spain.Previous to this move i spent 14 years managing restaurants after training to be a chef and then moving directions into the management side of things.We both dreamt of our move for a long time and wanted to own a property where we could provide holidays for people and use my skills of hospitality and knowledge to ensure everyone had a great stay.Once we found our property the rest all fitted in to place and now 13 years down the line we have a wonderful complex where everyone has a fantastic holiday.We welcome everyone to come and you will love our accommodation and of course our wonderful area and we would love to meet you all! After searching all of the South of Spain on the coast and inland for around 8 years we eventually found our perfect location,Iznajar.We chose to buy here due its fantastic location and proximity to all the wonderful cities of Andalucia.Our luxury property is only 10 minutes from the main motorway of Andalucia that gives you easy access to tour Granada,Malaga,Seville,Cordoba,Ronda,Gibraltar,Nerja,Priego De Cordoba plus many more places including white washed villages that are wonderful,the real Spain! You can enjoy our wonderful views and quiet location and then get to all the hussle and bussle really easily.Everyone who stays at Casa Pino Solo loves the area andcoming back from a day touring to relax in the jacuzzi with a nice glass of wine and eating outdoors al fresco style! Our property is very unique to our area having the best facilities around including a large seasonal heated pool(not heated Nov/Dec/Jan/Feb/March),hot tub and games area,cinema room unlimited wifi and perfect for a holiday any time of the year. Air Con is in all bedrooms Our hot tub is brand new and top of the range with jets,led lighting and a waterfall giving you the ultimate relaxation after a days touring.It runs at 39 degrees day and night all year round so perfect for the Winter months. We have a wonderful cinema room with a 60 inch surround sound and many movies to choose from. We also have a wonderful 18 mile lake and beach only 5 minutes away if you fancy a change to just relax in a heavenly enviroment. There is a lovely beach bar here too and you can hire kayaks and sail boats. All bathrooms are beautiful,fully equipped and have power showers with fantastic pressure.In the main bathroom there is a big walk in shower room and off the gorgeous king size bedroom is a walk in shower that is massive.The one massive family bathroom has just been renovated and is absolutely stunning. Upstairs in the villa two bedrooms share the main bathroom which is 13ft by 13ft and all the rest of the bedrooms have their own private bathrooms.This is great for groups giving you your own privacy without having to share with anyone. There is a bathroom suitable for a wheelchair user and also this access stretches all round the whole downstairs of the villa including all the grounds outside. We supply beautiful towels that are the best quality and large bath sheets for comfort. We also have an outside toilet for pool area use and a shower by the pool for you to use and even supply your pool/hot tub towels for your ease. We have a log fire in the main living area with shoots all upstairs to take the heat up and full house of radiators. Full wifi all round the villa. We have two routers to sign in to with the same password and then as you walk round the villa it will automatically swap to the correct one to give you total coverage. You can go to Sierra Nevada to ski during December -April and this is one hour and 20 minutes from the villa. this villa is perfect for all ages as there are many facilities for everyone.There is a large seasonal heated pool,a beautiful brand new jacuzzi with 80 jets and top of the range,and a large games area with a pool table,table tennis and darts. WIFI is free for you all here and unlimited. We can organise a flamenco dancers for you upon request and there is also a poker table and many books to read. We are able to offer a beautician on site for a pamper day,aqua aerobics,,and a large selection of hot food delivered in.you can hire kayaks sail boats and pedalos on the beach. We can also organise flamenco dancers by the pool or a coach hire to take you to the city for a special flamenco evening out. If you are celebrating a special occasion we can also organise local restaurants for you and you can even learn how to make paella. Brand new cinema room for you to enjoy!! Where to start with this beautiful property. We travelled as a large family group and this villa had something for everyone. From the swimming pool to the hot tub, the pool table to the dart board- there is plenty to do. Incredibly spacious and spotlessly clean there is nothing to fault at all. Lisa and Nigel cannot do enough for you and their knowledge of surrounding areas is excellent. They will also advise on best restaurants etc if you want to eat out - lovely couple who go out of their way to make your holiday experience amazing. We have had many villa holidays but none have been as good as this. Took the whole family, 10 adults and 9 kids aged from 6 to 17 and had the most wonderful holiday. The villa had everything you could possibly need, the scenery was amazing and Nigel was a mine of information. Thank you for your lovely 5/5 review we reallly appreciate your comments. Thank you for your wonderful 5 out of 5 review and it was so lovely to meet you all.We hope you return in the future and if you do we will be here to welcome you with open arms. This beautiful villa is situated in a wonderful location and has all amenities close at hand with a few tapas bars/restaurants to walk to and many restaurants within a 10 minutes drive radius.For evenings out if you want to go a little further than walking distance transport can be arranged for you whether it be to a local restaurant or a city night out.Food is wonderful and cheap and there are many great places to go. 10 minutes from the villa is the main Andalucian motorway,the A92 to take you to all cities at ease.You can visit,Granada,Malaga,Seville,Cordoba,Ronda,Anterquera,Alpajurras mountains,Subetic National Park,Loja,Nerja plus many white washed villages,so perfectly situated for Andalucia and beach. Iznajar is 5 minutes drive and is steeped with history and has its own beach and a 18 mile lake great for a day out.An Amazing holiday! Golf: There is a fantastic golf course at Antequera which is only 25 minutes drive from our villa and it is really competitively priced.Many people from the coast travel to use this golf course due to the quality of it.Our villa is a perfect place to stay and you can get to play golf every day if you want.A perfect venue for groups of golfers to enjoy your activity in the day and come back home and rewind using our gorgeous heated pool and hot tub. Ski: The sierra Nevada ski slopes are around one hour 15 minutes from our villa enabling you to get the best of both worlds,spend a day in the snow and then back to sun the following day.You can drive to Sierra Nevada yourself or you can go on organised tours ran by our local Adventure Sports company.